First time for a few weeks we had a normal beer tasting Saturday night, quite a varied section of beers and some very good food as well. 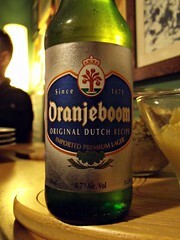 We started the night with an Oranjeboom, Premium Lager from Holland, we had, had it before but Jonathan had bought these for about £0.50/bottle. 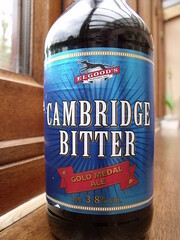 Although these were 4.7% rather than the 5.0% they used to be, the brewery and brand have been bought a sold many times in the last few years and the recipe has also been altered. 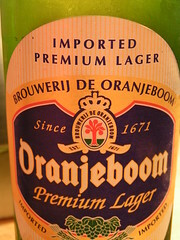 According to the label this is the "Original Dutch Recipe"
4.7%, (not 5.0%) pale yellow with no head, slight malt aroma, sweet malt taste, I do not know if it is just the name playing tricks on my mind but I can taste oranges, well something citrus anyway. 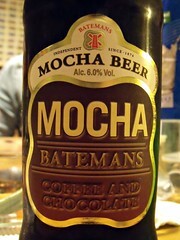 We swiftly moved on to the first of the new beers of the night, Batemans, Mocha Beer from England, I did not like the sound of it but again we got them cheap. 6.0% deep ruby red colour with a good head, lots of chocolate in the aroma, the taste is a mix of chocolate and coffee, I will not buy another but the others all loved it. 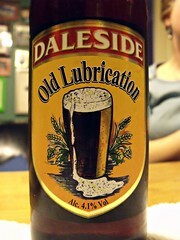 The next new beer, Daleside, Old Lubrication from England, I had a bit of a bad start with this brewery and wasn't over impressed with their marketing or labelling of their beer's (I will write about it someday). Now however (especially after spending two days in their deer festival at the 2010 Tall Ships in Hartlepool), I now really like some of their produce. 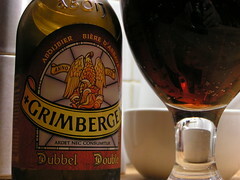 4.1% amber colour with a thin head, malty aroma and a caramel malt taste, very drinkable. If you shop for beer in England, you must have noticed this rash of low alcohol beers that have hit the shelves, by low I mean 2.8%, not the usual 0.5%. I have had a few now and will have to to a blog about them soon. 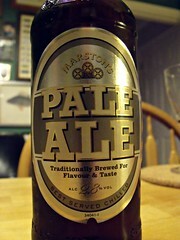 Tonight's was Marston's, Pale Ale from England. 2.8% gold colour with a thin head, malt aroma and malt and hop taste, not too bad, it's just a week bitter. 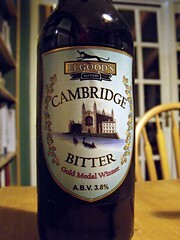 The rest of the beers we had were not new to us but were very good, one was Elgood's, Cambridge Bitter from England. 3.8% amber colour with a thin head, malt and hop aroma malt and hop taste, I have to say the new label is much improved on the old one. 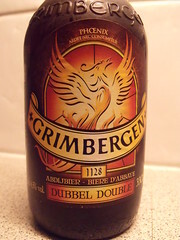 As opposed the the last one we had, with Grimbergen, Double from Belgium, I think the old label was much better than the new one. 6.5% very deep amber/red colour with a good head, sweet caramely malt aroma, sweet malty fruity taste with a slight bitterness, very tasty and warming.